Hedrin Lotion is a new way to eradicate head lice in adults and children aged 6 months and over..
Work into the hair spreading the liquid evenly from the roots to tips. Allow the hair to dry naturally. Wash the hair with normal shampoo, rinse thoroughly with water and dry. It is important that Hedrin Lotion is applied again after seven days to deal with any lice which may hatch in that time. Failure to repeat the treatment may result in the return of a louse infestation. 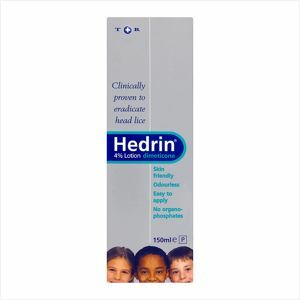 Do not continue using Hedrin if a skin rash or other signs of hypersensitivity occur. Keep hair away from sources of ignition, especially naked flames and burning cigarettes, whilst being treated with Hedrin. Treated hair can readily burn if ignited. Hedrin solution is applied to the hair and scalp and is for external use only. Do not use if you are sensitive to either of the ingredients in Hedrin. Take care if accidentally spilled as Hedrin may cause a slip hazard.